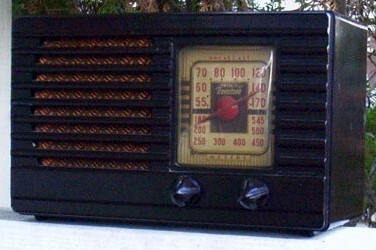 Highly collectible, this little radio packs a big sound. No chips or cracks in cabinet. It features a right front square dial with the famous "red dial pointer" with overlapping horizontal louvers; two knobs. It uses five tubes; broadcast only. Great radio! 8-1/2"W x 5"H x 4"D.
You are visitor number 3,438 to this page.